For various reasons I find that Microsoft stock is one of the best individual examples for demonstrating the importance of relative valuation when you’re thinking about returns. The usual example will be the returns from the height of dot-com era and what happens when you end up paying way too much for a company’s profits. Anyone buying Microsoft stock at the peak would have only seen returns of 2.3% a year between 2000 and today assuming reinvested dividends. The reason for that is well known but when you have a $500bn company trading for 80x earnings then there’s a good chance forward returns will be poor. No further explanation needed. The thing is that you could have actually bought the stock nearly two years after the peak – when it had fallen some 50% – and still have suffered terrible returns for over a decade. The really jarring thing about that is that the business had done quite well. Let’s say you pick up the stock at the end of October 2001 for $27 per-share. That would have valued the shares at around 30x annual earnings excluding one-off charges – so they still look fairly expensive, but remember there’s still the prospect of decent growth and future dividends to balance things up. In the decade that followed you saw the company increase earnings from $0.85 per-share to $2.69 per-share – equivalent to about 11.5% a year on average. You saw them increase the dividend by 29.5% a year from their first payment in fiscal year 2003. Finally you saw them retire 20% of the shares outstanding whilst building a $41bn net cash war chest on the balance sheet. By any measure that is an exceptional operating performance, except one: a $10,000 investment in Microsoft stock made in mid-October 2001 would be worth about the same amount by mid-October 2011. If you include reinvested cash dividends along the way then you maybe made enough to just about keep up with inflation and preserve your wealth. Now for a lot of folks that would be enough to throw in the towel on Microsoft stock. It’s not like a decade doesn’t represent a reasonable time-frame to hold some shares and expect to see some solid results in terms of your wealth. The fact of that matter is though that all of that great business performance: the double digit EPS growth, the dividend growth and the steady stock buybacks were all undone by further brutal compression of the valuation multiple. 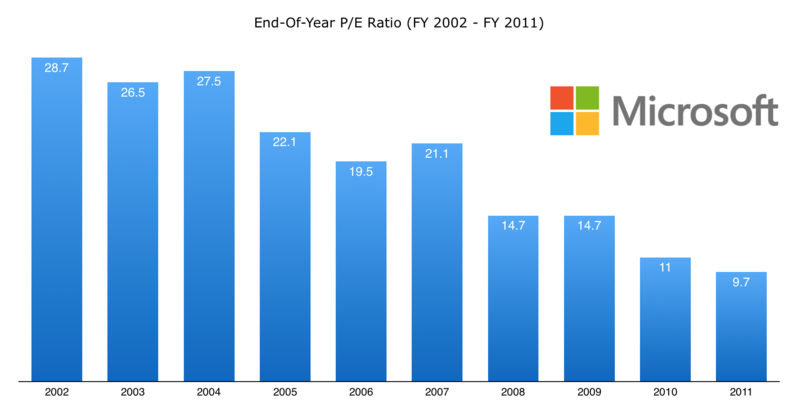 By the end of fiscal year 2011 Microsoft was trading at under 10x its annual earnings compared to the 30x earnings it was in mid-October 2001. That’s a huge hit to shareholder returns. The shares have basically ran through the whole spectrum of valuations since the dot-com era. On one end you have the absolute extremes of paying 80x earnings at the height of the bubble, where it basically requires a miracle to emerge with good shareholder returns over a ten year period. As you move closer to equilibrium you get to the post-crash situation where you had investors paying 29x earnings for respectable forward growth of very high quality profits. Even in that situation there’s a lot of downside risk but it could go both ways. If the stock ends up trading in 2011 with the forward P/E ratio it has today then you would’ve seen average compounded returns of 8.40% a year over the prior decade. At the opposite end is the situation between 2009 and 2012. The earnings-per-share growth has fully grown into the excess valuations of previous years and the shares have dived well below fair value. By October 2011 they are trading at 10x annual earnings and paying out a 2.4% dividend yield worth just 24% of the company’s net income. That’s when shareholders find themselves in a situation in which the value thing works from the other side of the coin too. They’ve seen the share price increase by 17.3% a year even though earnings have remained relatively flat. They’ve seen the dividends go up by a similar amount. Throw in the effect of reinvesting them along the way and they would be looking at annual compounded returns of 20.5% a year. If you add that to the wider period then between October 2001 and today the returns would have worked out to 7.75% a year assuming reinvested dividends. There’s a couple of conclusions I’d draw from that. The first is that it’s always better to hold on to a high quality business even if you overpaid originally. Microsoft stock has outperformed Apple, Cisco and IBM over the past five years for example – so investors who bailed out in 2011 may well have struggled to generate better returns if they traded into peers. The second point is that this example proves a strong case for employing some kind of dollar cost averaging. Say you think Microsoft back in 2001 presents some good prospects for growth, having already appreciated how high quality the earnings are. The only problem is that the large P/E ratio means there’s a strong chance that won’t translate into similarly good shareholder returns. Dollar cost averaging is a great way to get around that. Imagine you make a $10,000 initial investment back in 2001 and decide to follow it up with further investments of $2,500 each quarter thereafter (i.e. another $10,000 a year). In that case the total returns, including reinvested dividends, would work out to $405,000 worth of current Microsoft stock. That’s equivalent to 10.9% a year between then and now, and pretty much exactly in-line with the business performance in terms of earnings growth. For comparison the S&P 500 has returned 6.4% – so not a bad returns from an initial investment at 30x earnings and autopilot investing thereafter.